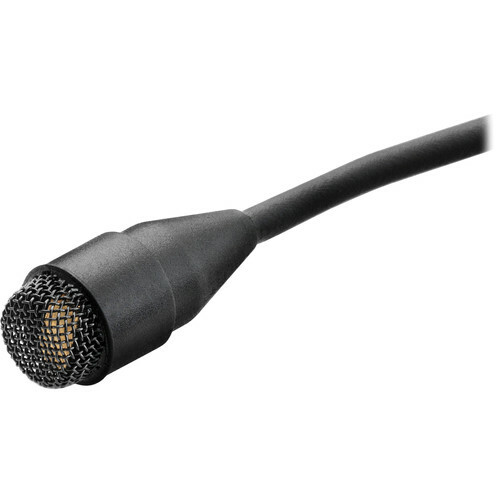 The black d:screet SC4063 Miniature Omnidirectional Microphone, Lo-Sens & Lo-DC with Microdot and 3-Pin LEMO Adapter from DPA Microphones is a low-sensitivity, low-voltage mic designed for use with wireless systems in theater, television, and close-miked instrument applications. Because of its small size, the SC4063 capsule is highly unobtrusive and also features an accurate omnidirectional polar pattern that does not need to be aimed directly at the sound source to achieve quality-audio pickup. This d:screet SC4063 miniature microphone is acoustically identical to the d:screet 4060 miniature omnidirectional microphone (high sensitivity), but is built with an FET preamplifier in the input stage, which is designed for working with a lower supply voltage. In addition, the d:screet SC4063 microphone delivers a clear, consistent, natural sound and works across a wide dynamic range, and demonstrates low-distortion even at very high SPLs. Additionally, high- and soft-boost grids are also included, allowing you to alter the 4063's tone based on its placement. Low noise and low sensitivity. Handles loud SPLs without distortion.